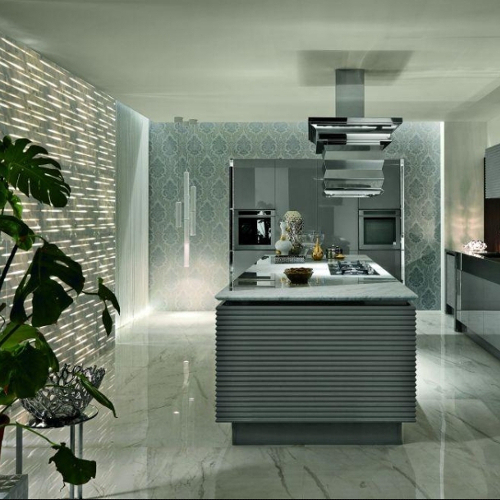 MIZAR, a star for the LUXURY GLAM dream by Aster Cucine. “There is no such thing as the perfect living space, there is only the space each one of us imagines, where each of us dreams to be.” “Mizar“, the starriest of all our translucent wall panels from the “LE PIETRE LUMINOSE” collection. “Lithos Mizar” adds the final touch to the shooting set staging the new “Luxury Glam” kitchen dream by Aster. A super elegant mix of contemporary and retro elements, precious sceneries lit up in silver, greys playing the lead according to the newest and most sophisticated style trends of interior design. These are some of the moods characterizing the new “Luxury Glam” kitchens collection by Aster, particularly in its “Doghe”, “Telaio Silver” and “V” versions. On the set, the dream that inspired this new collection comes true, also by means of the mesmerizing luminous trails filtering through the “Lithos Mizar” modular backlit panels in carrara ghiaccio marble, which reveal its most intimate nature, are refracted on the mirror-like polished surfaces, and recall the pure, elegant lines of the horizontal planes. Emotional images speaking of a corporate vision based on love for what you do, on excellence as a consequence of your passion for the product; a common feeling which made cooperation not only possible, but also pleasantly stimulating for two companies who are deeply involved in spreading worldwide these fundamental traits of Made-in-Italy design. Like we Italians can.